The project started well, with many of the volunteers arriving over the weekend and camping at the project area. When I arrived on Monday morning at 8:00, most of the volunteers were already there! The project was to continue and possibly complete surface recording of a large lithic-scatter site on the edge of the high desert. Past local volunteer projects, a field school, and some in-house FS personnel heritage training at the site had resulted in recording about one-third of the known site area. Our goal this year was to finish defining the site area by doing a sample recording of the remaining area. A problem at this site is the thick juniper and bitterbrush, which make it very difficult to see any reference points or even walk a straight line. It is very easy to get turned around and go wandering off in the wrong direction! To address this, volunteers measured out and marked 100-m squares on true north to set up a grid system for sampling the remaining site area. To record a 100-by-100-m square, the volunteers lined out the sides with string to mark the boundaries, then pin-flagged every artifact they could find within the square. Last, they mapped in what was found in the square and wrote up a brief description. Using this method, the 22 volunteers with the assistance of 6 archaeologists and archaeological technicians recorded 130,000 square meters of the site area in one week! During this work the volunteers recorded 13 projectile points, two drill fragments, one ground stone fragment, one scraper, numerous biface fragments, and 1,422 flakes. They also had time to investigate some circular rock alignments, which turned out to not be associated with any substantial cultural material and are probably natural. Several other shovel probes did confirm that subsurface deposits do contain additional cultural material to a depth of at least 50 cm. We did not find the absolute boundaries of the site, but did find where the cultural material begins to “thin out” to only 10–20 flakes in a 100-by-100-m area, and we now have a pretty good idea of where the dense areas of the site are. I believe everyone enjoyed the social aspects of the project, with 28 participants over all and a nice potluck late in the week. We also enjoyed the wildlife (bald eagles and three types of snakes, including rattlesnakes) and the scenery. Mostly, I hope the volunteers enjoyed working at the site and that they learned about the archaeology of this part of central Oregon. 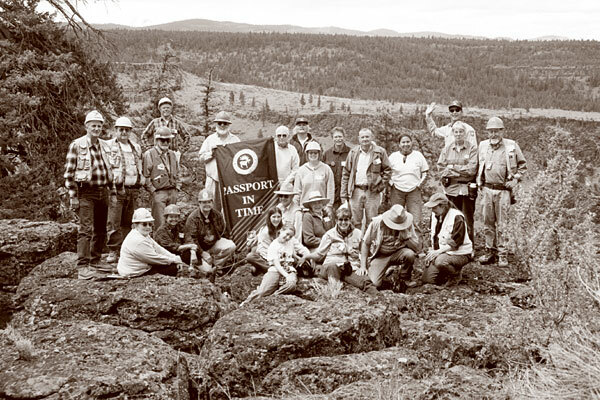 A special thanks to members of the Archaeological Society of Central Oregon who also participated in the project, and to Site Stewards Ginger and Bob Shive. Future analysis of obsidian tools from the site may help in learning about settlement-pattern changes through time by looking at changes in obsidian sources for different point types from the site. A pollen wash of the ground stone fragment will also provide information about what was being ground at the site—was it the local lomatium plants?